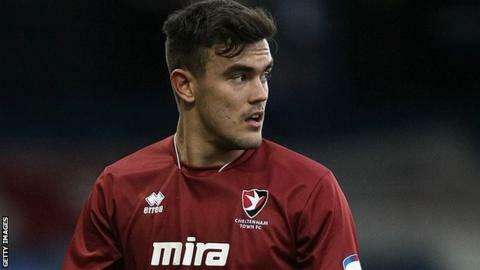 Cheltenham manager Mark Yates has confirmed midfielder Marlon Pack is still in his immediate plans. Pack, 21, agreed a move to Swindon Town on transfer deadline day but the Football League refused to ratify the deal because a proposed takeover of the League One club had not been completed. Yates dropped Pack for Saturday's win over Torquay but says he will play a part against Bristol Rovers on Tuesday. "He's going to come for a chat and we'll take it from there," said Yates. "I offered him the chance to have a couple more days off but he wants to be involved straight away. "He's our player and although he wasn't involved at the weekend, he'll be involved tomorrow [Tuesday]." Pack is out of contract in the summer and Yates told BBC Gloucestershire on Saturday that he does not expect him to be a Cheltenham player next season. The midfielder was set to join Paolo Di Canio's Swindon on loan until the end of the current campaign, with a view to a permanent move. Cheltenham were also set to receive £100,000 for the former Portsmouth trainee and also sign out-of-favour Town winger Luke Rooney as part of the deal. And although Pack's move is on hold, Yates confirmed: "We haven't been able to make contact with Swindon yet but Rooney will be here with a view to training with us." Rooney, 22, was signed by Di Canio from Gillingham in January 2012 and made 20 appearances last term. But he has fallen out of favour at the County Ground this season, and after loan spells with Rotherham and Burton, he is now thought to be training away from the rest of the Swindon squad.